Hvorostovsky offers searching readings of these rugged, jagged songs which are full of resignation and bittersweet regret, of loss and separation (...). There are few things finer than Hvorostovsky in full flight. 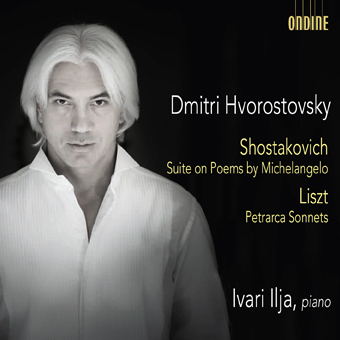 Ondine's fourth release together with star baritone Dmitri Hvorostovsky features a program of sonnets by Dmitri Shostakovich (1906-1975) and Franz Liszt (1811-1886). Hvorostovsky is accompanied by his longstanding duo partner, the Estonian pianist Ivari Ilja. Shostakovich's setting on the poems by Michelangelo is the composer's final masterpiece and among the greatest achievements in 20th century Russian vocal music. The work in 11 movements is filled with deep meaning. In his work Shostakovich, already seriously at that point, contemplates the themes of life and death. Liszt's three Sonnets by Petrarch are based on the love poems by the Italian Renaissance writer. Liszt wrote numerous sketches for the work and also completed several versions of it. For a good reason Liszt was very satisfied with his work: "I think they have come out exceptionally well, and are more perfect in form than anything I have published until now."